Mushishi is an adaptation of Yuki Urushibara's award-winning manga of the same name. The series adapts the first 26 chapters of the manga, adapting one per episode. The anime aired these stories in a different order than that of the manga. The series won the Tokyo Anime Award in the Television category in 2006. The series premiered on October 23, 2005, but went on hiatus on March 12, 2006 after having aired 20 episodes. Broadcast resumed on May 15, and aired the remaining 6 episodes, concluding on June 19, 2006. &ldquo;Don&rsquo;t let yourself be blinded by fear or anger. Mushishi is essentially a series of stories styled after East Asian legends and folktales. In lieu of gods, spirits, and demons, the paranormal phenomena are attributed to more primitive yet no less enigmatic creatures called &ldquo;mushi&rdquo;. Dealing with their kind is the expertise of &ldquo;mushishi&rdquo;; professionals whose role may be thought of as an amalgam of healer, exorcist, biologist, X-Files investigator, and Jedi master (well, sort of). Ginko happens to be one of these mushishi and he wanders from town to town, looking for interesting cases and lending a helping hand to those adversely affected by these mushi. As formulaic as its premise may sound, no two incidents are alike and every episode features not only different mushi but a different setting and cast as well (with Ginko as constant exception). Because of these, the series is able to experiment with various concepts and human relationships and none of the stories ever end in a predictable manner. As such, there is little room for stagnation as each tale manages to be unique and refreshing. The title is often mentioned in the same breath as Kino no Tabi though Mushishi&rsquo;s oriental setting and animistic influences give it a more distinct flavor and theme. Whereas Kino limits herself to exploring &ldquo;what if&rdquo; scenarios by visiting different countries, Ginko takes it a step further by providing possible solutions and emphasizing the importance of living in harmony with nature, with fellow men, and most importantly, with the self. While not exactly an anti-hero, Ginko&rsquo;s personality is an unusual mix of benevolence tempered with common sense; a combination of &ldquo;grace to accept with serenity the things that cannot be changed, courage to change the things that should be changed, and the wisdom to distinguish one from the other.&rdquo; Saving lives is part of his job but he also knows when there&rsquo;s reason still to hope and when it&rsquo;s time to move on. He may break his own code at times for the well-being of the majority and he&rsquo;s not above fooling the gullible either just to get by. His expertise stems not only from his knowledge about mushi but also from his understanding of human nature. Similarly, none of these supporting characters are shoved into stereotypes which plague most anime and manga. No catgirls, lecherous geezers, or single-minded youngsters (Believe it! ); just regular folks in unusual circumstances due to encounters with mushi. Consequently, it doesn&rsquo;t require much effort to empathize with these characters even if most only appear in their respective episodes. Not only is the theme &ldquo;everything is only as it is&rdquo; evident in the content but it also permeates the manner in which the stories are presented. Mushishi doesn&rsquo;t try to impress; it simply delivers. While other shows of this era tend go overboard with the fancy CG animation, Mushishi&rsquo;s visuals remain spare yet aesthetically pleasing. Rather than filling up the screen with explosions and fanservice shots at every possible moment, vivid scenes of natural beauty such as raindrops falling from the heavens, cherry blossoms drifting in the wind, and sunlight penetrating the dense foliage are shown instead. Of course, the viewers are occasionally treated to fantastic scenes showing the surreal characteristics of the mushi but these are shown only when called for in the stories and nothing is done in excess. Even the character designs are relatively plain but perhaps these also contribute to the story in their own way since the audience is less likely to judge the characters based on their appearances. Likewise, the audio takes the minimalist approach. The soundtrack is comprised of simply melodies which are surprisingly effective in evoking various thoughts and emotions. Ranging from haunting and heart-rending to hopeful and bittersweet, the music often eliminates the need for more words in the most crucial scenes. Also worth noting is the lack of exaggerated voice acting which makes the cast sound more like real people rather than cookie-cutter characters. In addition to its enchanting audio and visuals, Mushishi also serves drama and thought-provoking content in balanced amounts. Its subtle content and execution never insult the intelligence and present several interesting ideas without drowning the viewers in philosophical jargon or sophistry. All in all, Mushishi truly is one of the finest anime specimen out there. In spirit, at least, each episode of Mushishi strongly reminds me of one thing: A cave painting. A depiction of man and the outside world, brief and primal but perfectly expressive, radiating mysticism, perhaps possessed of more meaning than it initially appears to have. From minute one, Mushishi's representation of a vast world grabs the eye and doesn't let go. Lush forests with dew dripping from every leaf; barren winter mountains peppered with stubborn snow-covered trees; an innocuous pond with lilies on the surface of the still water. The series roams from setting to setting, and all are presented with a lifelike attention to detail. The color palette is richly varied, reaching from the brilliant emerald of vegetation to the deep turquoise of the sea to the dusky red of a far-off sunset. Lighting is used to strong effect, whether it's beams of sun streaming through layers of foliage and mist or a candle's flame struggling to brighten a dark old house. And within those habitats, the mushi themselves, creatively rendered as a strange mix of the familiar and the utterly alien—like shapeless blobs propelled by twitching motions, like phosphorescent insects scuttling along the earth, like great legless serpents twisting skyward. Some take the shape of a natural phenomenon, and the sight of a living rainbow exploding from the earth, or a long-restrained cloud breaking free, expanding and floating away, is bound to impress. The animation on the whole is excellent, but the mushi in particular seem to move with a vivid otherworldly fluidity. At least part of Mushishi is about making sense of the mysterious, bringing reason to something that seems unreasonable, and the designs of the mushi add some believability to this; it's quite easy to see how they could be thought of as ghosts, beasts, or legends, able to inspire both wonder and fear. The tranquility of the environments is consistently impressive in a low-key way, but the spectacle of the mushi can be eerie, majestic, and everything in between. Sound is part of atmosphere, and in the same way that cold urban horrors might use reverberations in dark alleys or the foreboding thrumming of electronics, Mushishi might use a chorus of insects or the roar of drifting snow to surround us, allowing the setting to speak its piece. The music is minimal but startlingly effective, in many cases fitting easily alongside and even seeming to mimic the voices of the earth. Slow piano notes overlap with rhythmic footsteps, a woodwind's sad screams resemble those of a forlorn bird. So, too, can the score sound almost unearthly, with an ominous progression of bells and chimes sometimes underscoring a haunting ending or signaling the arrival of the mushi. The result is an immersive ambiance where visuals and sound alone can convey dark, brooding tension or innocent curiosity with equal ease. It isn't just pretty, it's totally engrossing, exuding pure atmospheric mastery in almost every scene. Through this vast world walks Ginko, revenant of revenants, our looking glass. Perceptive of the nature of human and mushi alike, he uses words as careful and deliberate as his journeying stride to become the voice of reason and, with an air of serene confidence, impart his knowledge to others. To become a witness to needless death, a bearer of bad news, or a participant in deception is sometimes part of his job description. As an admirer of life and truth, he cares for none of these tasks, but he'll defy his own nature and undertake them with solemn dedication if he feels that it's necessary. He is wise, but not infallibly so. Nor is he a complete stoic; outbursts of childlike wonder at incredible sights, sarcastic retorts to smart-mouthed travelers, and emotion-laden shouts of panic and warning to his fellow humans all show him as a little more than just the nonchalant white-haired sage. His development, in the traditional sense, is sparse, but he is afforded a poignant backstory that makes him and his thought process a little less of an enigma. Of course, Mushishi gently pushes a picture of a sprawling and intricate world where all beings affect each other in ways both seen and unseen, their actions rippling outward in ever-widening circles, and in that sense, Ginko as a character is no different than any other living thing in the show, simultaneously of little and great consequence. He may be our guide, cursed and blessed to ceaselessly wander, but the world doesn't turn for him. Rather, it's in what he represents that we might find significance: The quest for knowledge, the insatiable desire to understand even while knowing that the sheer body of things in existence prevents total understanding. The need to capture the meaning of what surrounds us, spread our wisdom responsibly, and use it to form calculated reactions to the world instead of rash judgments. He truly is that silver fish swimming endlessly through dark water, opalescent barbels probing fathomless black crevices, illuminating them, if only for a brief moment. Much of Mushishi's strength lies in the ability to provoke thought without direct questions, to let an image serve as subtext, and Ginko himself represents an impressively seamless merging of humanity and idea. Mushishi is episodic, not bound by an overarching plot. It is a series of self-contained stories which vary in theme, but are always skillfully crafted. Most episodes consist of human drama, based on relatable and familiar emotions, infused with an element of the natural world. The episodic format delivers powerful and gripping tales in an extremely brief timetable, a feat which I have no problem appreciating. The scenarios are original, and the writing is rich with little subtleties and metaphors, but each episode can be understood and appreciated as successful story even if you've no desire to peer into them deeply. View Mushishi as a progression of intelligent parables full of interesting ideas, or as a bunch of moving and affecting tales; much to its credit, it is both. Part of what makes Mushishi work is its steadfast refusal to portray anything in terms as simple as “good” or “evil.” Stories where barbaric man stupidly abuses mother nature, or where nature is a hate-filled monster that comes from the hills to eat scared little man, are a dime a dozen, and while they might pass as entertainment, they often fail to say anything worth saying because they handle man and earth as if they're combatants in a holy war. Mushishi is not so black and white, and it has an idea that scales much better. The mushi are not red-toothed animals seeking to kill in droves. The humans are not greedy savages bent on scorching the earth. Both are just beings, trying to survive in the same place and at the same time. That they will cross paths, have conflicting interests, use each other, and hurt each other is inevitable; such is survival. Each episode is one meeting of mushi and human, one miniscule butting of heads in a massive world, with the implication being that this is simply what happens, everywhere. Instead of vilifying humans or portraying nature as a vengeful power, Mushishi whispers: This is just the way things are. It does give us a small shove by implying that, as the ones with the ability to reason and understand, the responsibility for mitigating the damage that humans inflict (and the damage that humans receive) falls on the humans, but it never degenerates into the preachy heavy-handedness or gross oversimplifications that plague many works with similar themes. It's that theme which allows Mushishi to navigate the spectrum of human emotion. Conflict in its world does not arise from moral failings or piggish greed, only from a lack of understanding, and understanding is a sword with many edges. Ask the child who learns of death, or the old man who learns of life. Sometimes the knowledge you gain is liberating, sometimes it's disheartening, sometimes it's terrifying. Mushishi can be all of those words and more, but even when it strays to one extreme, it never loses its humanity, its worldliness, or its feeling of being completely natural. Just as it can depict the warm orange rays of the sun and the cold white howl of the snow, it can depict innocent wonder and violent loss, and with equal sincerity. It has balance, and then some. As a caveat, I will say that this is the kind of series that practically begs me to use the phrase “not for everyone.” It's dialogue-heavy, more about the thought leading up to action than the action itself; it keeps the big guns of its visual spectacle on a tight leash, letting them explode only after a suitable buildup to assure the maximum payoff; it doesn't have the conventional storytelling satisfaction of explicitly coming full circle, instead simply tapering off and fading quietly, as episodic series sometimes do. A few episodes will likely be enough to inform you of whether or not it's to your tastes, and I've no doubt that many have labeled (and will continue to label) it as simply “boring.” I understand the origin of this opinion, but I just can't share it, because Mushishi is strangely beautiful and intensely fascinating on several levels. Imbibe it a little at a time like a fine liquor, or dive deeply into it and become drunk on its atmosphere, intrigue, and insights. In my experience, neither disappoints. This anime was a very unique experience. The show introduces a very interesting concept called the mushi. It'd be very difficult to describe what the mushi are precisely. In a nutshell , they're essentially spiritual beings, but at the same time they inhabit the physical world ( Yeah I know what your thinking, you just completely contradicted yourself. I know, I know just go with it) and they use humans as a host ( very similar to a parasite). One aspect in particular that struck me about the show was how it was devoid of any western influences whatsoever. Many anime fans don't realize how anime is indeed heavily influenced by Western culture. But Mushi-shi primarily borrows stories from many east Asian folklore and myths. Although Mushi-shi does offer an original and innovative premise/concept, the execution is most certainly flawed. The story of Mushi-shi follows the exploits of Ginko, who is otherwise known as the Mushi-shi or Mushi master in the English dub. 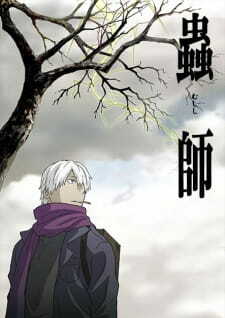 Ginko's job as a Mushi-shi is to go around and help people who have been infected by the mushi. This is one of the flaws to Musi-shi, which is it's formulaic plot. As you go through these episodes you'll notice that 90% of the them play out like this: Ginko is wandering around, he encounters a village, group of people or an individual who have had an encounter with the mushi. Which in turn, leads to them being harmed to the point were they're crippled or their lives are hanging on by a thread. Ginko attempts to save them. His efforts leads them to being cured or sometimes the episode will end off tragically where the one infected dies. Basically, this formula repeats for 26 episodes. Yeah.....the series is a tad bit repetitive. Notice how I said a tad bit repetitive and not overly repetitive. Because what saves it is the mushi themselves, there isn't a single episode where the mushi are exactly the same; it's always fascinating to observe them, because the way they interact and work with humans is so compelling. Oh and did I forget to mention that Mushi-shi has no main storyline ? Yes, this is an episodic anime where each episode is it's own standalone story. This wasn't a problem for me, but I know it will be for some. Because of course, most people generally prefer a main ongoing story. Again this wasn't a problem for me. Also, when I say episodic, I mean it. It's not like Cowboy Bebop or Samurai Champloo, where it's episodic in nature but it has an overarching story. That’s not the case with Mushi-shi. Plus there's no recurring characters in the show except Ginko. I mean, if someone was to walk up to me and say "hey, I found Mushi-shi to be a phenomenal anime and I absolutely loved it," I'd completely understand. If somebody else walked up to me and said "hey, I found Mushi-shi to be extremely boring and I didn't like it," I'd also completely understand. Because of how literally quiet and subtle it is (not recommended if you got A.D.H.D), which isn't a bad thing by the way. Mushi-shi is definitely not for everyone; it's not meant to appeal to the masses, its meant for a niche audience who can truly appreciate its fascinating concept and artistry. It's very reminiscent of an independent arthouse film. Arguably the best part of Mushi-shi, from the score, to the voice acting and even just the sounds going on in the back ground. The opening track is called " The Sore Feet Song" by Ally Kerr and its a solid one overall. You'll probably enjoy it if you like folk rock. Something that is also very unique about Mushi-shi is the ending theme, or should I say ending themes, because every episode has its own closing song and I got to say, I liked all of them. It's hard to describe them because the instrumentation is so unique and each one feels so surreal and atmospheric. They have an otherworldly vibe to them. Then we have the actual score within the show which is also great and complements the mood excellently. Like the closing themes, the score has an otherworldly vibe as well that I can't put my finger on. Finally on to the voice acting, which is outstanding on both the Japanese sub and English Dub. No seriously, it's that good, especially the English dub which in my opinion surpasses the original Japanese and it ranks up there with Funimation’s best work like Baccano, Yu Yu Hakusho, and Fullmetal Alchemist. Both Yuto Nakano and Travis Willingham embody the character of Ginko perfectly, and all the other cast members do a great job as well especially considering that fact that they only appear once. Also, pay attention to the tone of the voice acting on both languages and notice how monotone and subtle it is. Don't let it discourage you. This is completely intentional because it's meant to match the quiet and subtle tone of the actual show. Finally, we get into the last part of the review, the art and animation. The animation is very good and smooth, but the art (especially the backgrounds) is absolutely stunning. You'll know what I mean when you watch the series for yourself, just pay close attention to the detail that is given here. From the lush green vegetation, to the mountains and rivers. It's absolutely gorgeous. I recall when I was watching it, I had to pause the show for a moment because the backgrounds were so beautiful to look at. Hands down, some of the best you'll find in all of anime. I guarantee it. When it's all said and done, Mushi-shi has it's flaws and at the same time it has a lot of good things going for it. It's formulaic tendencies really held it back. Plus, Ginko could have been fleshed out more. Regardless of that, this anime was a joy to watch and it's a good solid one at that. If you have an open mind, I recommend you check it out, especially if you want something that is unique and original.